The v6 HotEnd Full Kit from E3D has been redesigned for your convenience from the ground up! This new hot end contains the same signature high temperature performance for high-temp printing, as well as increased functionality for printing soft and flexible filaments. The v6 HotEnd allows you to print a wide variety of materials, from soft and flexible to sturdy and strong. This is possible due to the PTFE (Polytetrafluoroethylene) liner tube through the hotend that you can extend into your extruder - this gives the ability to add the confinement and constraint needed to make excellent quality prints with flexible filaments. This technology opens new doors for your 3D printing aspirations. With High Temperature Performance, you can print with high-temp materials like Polycarbonate and Nylon - this also eliminates HotEnd meltdown failures that are common with PTFE designs. Even though the v6 has a PTFE liner inside the hotend the liner is never subjected to high temperatures so there is no risk of damaging the liner through overheating. Basically, this design is really in-tune with all the elements, so your prints will come out crisp and accurate. The v6 has cut back on a bunch of bulk. This clean-cut version's overall length is only 62mm, and there are significant reductions in the X/Y dimensions by using the new injection moulded fan duct. Are you eager to start printing right away? Good. So are we - and that's why here at MatterHackers we praise the v6 HotEnd. No adhesives, Kapton tape, or soldering is needed to get started. The new v6 simply locks into place with a little screw, high-temp glass sleeving is used to insulate the thermistor legs. 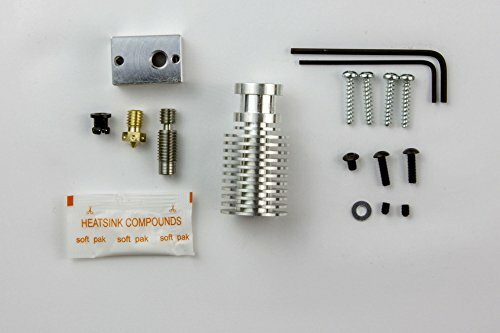 This makes installing the hotend (as well as removing) a quick and smooth process compared to earlier methods involving various adhesives.The parts of the hotend just screw together, and the fan duct naturally clips in - this can be manipulated in different ways to suit your setup preference. If you have any questions about this product by E3D, contact us by completing and submitting the form below. If you are looking for a specif part number, please include it with your message.